As you may know, I’m taking a Chinese class here in Costa Rica, so I’ve been following a blog about Chinese culture and language. 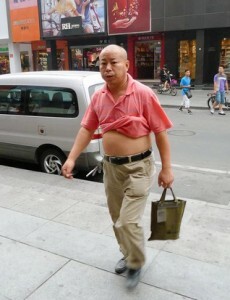 There was a funny and interesting article yesterday about men in China who expose their bellies (stomachs) when it’s hot. The post included the picture to the right, which I’ll include in case you don’t understand what I’m talking about. Anyhow, the Chinese phrase for this action is “bǎngyé,” which means “exposing grandfathers.” If you want to read more, the article really is interesting, so check it out. Also, it got me thinking, since lots of men here in Costa Rica also roll up their shirts and stick out their bellies when it’s hot. I think it’s pretty funny, since it’s usually men with gigantic bellies who do this. So, all of this inspired me to talk about a few vocabulary words and phrases related to stomach and bellies. 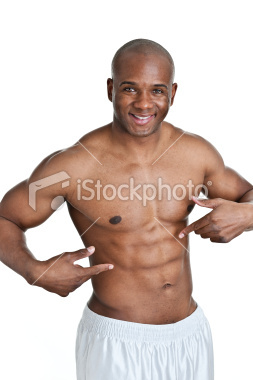 First of all, stomach is another general word for the area between your chest and your waist. “Stomach” can also refer to your main digestive organ. If you feel pain because of indigestion, you can say that you have a stomachache or that your stomach hurts. If you’re talking about the muscles in that part of the body, they’re generally called the abdominal muscles or simply the “abs.” A common exercise to tone the abdominal muscles is called “sit-ups.” When people do a lot of these exercises, they get very strong abs, and you can say that he or she “has a 6-pack,” since the muscles look like a 6-pack of beer or pop cans. So, to review, can you explain what each of these words means? Can you use them in sentences? I’m not sure if this video is supposed to be funny, but it definitely made me laugh! Thanks for reading –have a great weekend, free of bellyaches!